The name of the organization is the Dutch Chamber of Commerce in Sweden. The Chamber is a unique nationwide Dutch-oriented business Association in Sweden. It is a non-profit organization, free from any political or religious color. The purpose of the Chamber is primarily to promote, stimulate and facilitate Dutch business in Sweden, and secondarily to promote, stimulate and facilitate Swedish business in the Netherlands. In order to reach the purposes of the Chamber, regional offices can be located throughout Sweden and in the Netherlands. The decision-making bodies of the Association are the General Meeting (the Annual General Meeting and Extraordinary General Meetings) and the Executive Board. The Chamber’s day-to-day business is managed by the Executive Board. Loans in the name of the Chamber may only applied for after approval by the General Meeting and can only be signed for, by the persons mentioned in §6. The Chairman plus the General Secretary or the Treasurer together, are authorized to sign for the Chamber. The business year of the Chamber will run from May 1 to April 30. The accounts of the Chamber shall be kept according to Swedish law and sound accounting practice. In order to audit the accounts and management of the Chamber the Annual General Meeting shall appoint an auditor and a deputy auditor. The Annual Financial Report shall be handed the auditor no later than four weeks before the Annual General Meeting. The auditors shall complete their examination of the previous year’s administration and also submit their Audit Report on the same to the Board not later than on 30 May each year. 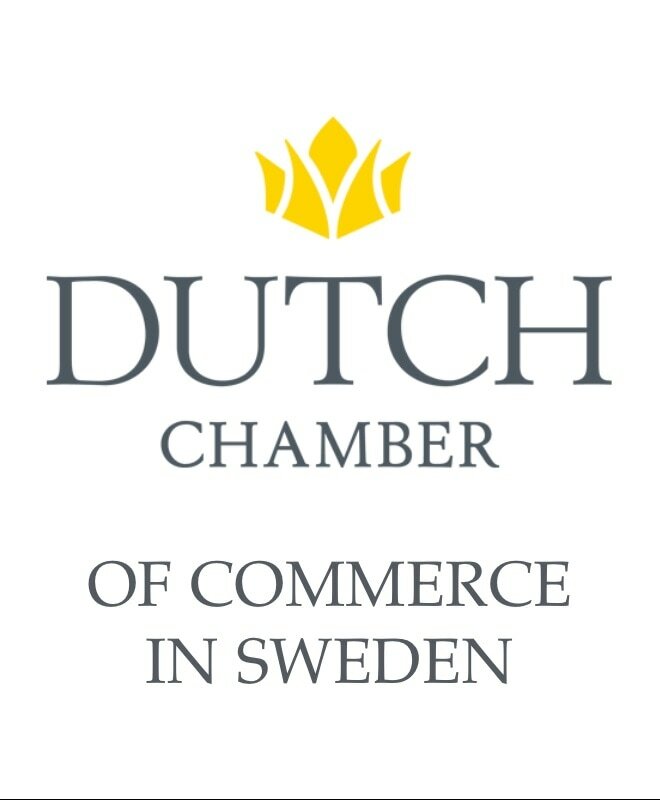 Chamber membership is open to organizations and individuals with an interest in Dutch-Swedish business connections. Individual or legal entities, operating in the Dutch-Swedish business arena can be ordinary members of the Chamber. Applications of admission are to be submitted to the general secretary, via online registration or in writing and membership is granted by the board. All members shall provide the secretary with contact information. The Chamber can use the information in a membership database, which will be for the use of the Chamber and its members and sponsor use only. Individuals or legal entities that specifically want to sponsor the Chamber can be supporting members of the Chamber. Members shall pay annual fees to the Chamber not later than October 31. The amount will be decided upon by the Executive Board. For members registered after 31 October, the annual fee is reduced by 50 percent. Fees are not reimbursable. The sponsors of the Chamber can either sponsor certain activities or sponsor the Chamber for one or more years at a time. The Executive Board will be responsible for any sponsorships and needs to report to the Annual General Meeting on these sponsor partnerships. Sponsors will have access to the membership database of the Chamber permitted by the laws of the EU and for members that have given their consent for this usage. The Annual General Meeting shall be held every year before July, at a time and place in Sweden decided by the Board. An Extraordinary General Meeting is held when the Executive Board deems it necessary or if it is called for by at least 10% of the Members in writing. Notice to attend the Annual General Meeting or an Extraordinary General Meeting, shall be sent by letter of e-mail at least 14 days before. The notice to an Annual General Meeting or an Extraordinary General Meeting shall specify the items of business to be dealt with at the Assembly. No other business may be settled at such an Assembly. Minutes of the Annual General Meeting and any Extraordinary General Meetings are to be kept. The minutes shall be checked and signed by the chairman and the minutes-checker of the meeting. Dissenting opinions shall be noted in the minutes. The General Meeting forms a quorum if at least 20% of the total numbers of members are participating in person, via electronic connection or by proxy. Decisions are adopted by an ordinary majority vote. Where the voting is even the vote of the chairman shall be determining. The voting takes place by acclamation or, if a member so desires, by a secret ballot. If not at least 20% of the total number of members are participating in person, via electronic connection or by proxy, the Executive Board shall call for a new General Meeting. The General Meeting shall appoint a Nominating Committee of two Chamber members, of which not more than one can be a member of the Executive Board. The Nominating Committee prepares for the Annual General Meeting a slate of one candidate for each office and auditors. The Chamber is managed by an Executive Board consisting of a minimum of 3 and maximum of 10 members. Executive Board members are elected by the General Meeting. If an Executive Board vacancy occurs during the year, Acting Board Members are nominated by the Executive Board and take fill the vacancy until the next Annual General Meeting. The Executive Board shall at least consist of a Chairman, a Vice-Chairman, a General Secretary and a Treasurer. Different roles and responsibilities are defined by the Board. The Chairman will preside all meetings of the Chamber and supervise the affairs of the Chamber. The Chairman is the convener of the meeting. In case the Chairman is unable to attend, the Vice-Chairman will take over the mentioned responsibilities. Summons convening a meeting with the Executive Board shall be made by e-mail not later than 14 days before the meeting. The secretary is responsible for minutes, maintenance of the membership database and co-coordinating of internal communication. The treasurer is responsible for all the financial assets and liabilities of the Chamber. The term of the Executive Board members is 2 years and is subject to extension for as long as there is an approved mandate from the General Meeting. Executive Board members exercise their role voluntarily. Minutes of Executive Board meetings are to be kept. The minutes shall be checked and signed by the Chairman and the board member who has been selected to be the minutes-checker of the meeting. If a Board member is absent from 4 or more consecutive Executive Board / General Meetings without prior notice to the Chairman or Secretary, they are considered to have resigned from the Executive Board. The Executive Board forms a quorum if at least three members are present. Decisions are adopted by majority vote. Where the voting is even the vote of the chairman shall be determining. The Executive Board may appoint persons authorized to sign on behalf of the Chamber and authorize representatives to represent the Chamber in other aspects. Each outgoing member of the Executive Board shall hand over his/her duties, records and any Chamber property to the successor in office. The Chamber and the Executive Board may be supported by an Advisory Board consisting of people who hold senior positions in relevant organisations. They voluntarily contribute with know-how and expertise and where possible, allow the Chamber to benefit from the resources that they have access to. The Advisory Board can be elected by the executive board on personal recommendation for at least one year, which is renewable and without determined time limit. The Executive Board can consult the Advisory Board about strategic steps and decisions and the Advisory Board can provide feedback and advice. The Executive Board is free to deviate from this advice. The Association may have regional representations in Sweden and in The Netherlands. These representations will be run by Regional Directors. Regional Directors are Chamber members, selected by personal recommendation and appointed by the Executive Board. They are executing their role on a voluntary basis. The minimum term of the Regional Director is 1 year and is subject to extension for as long as there is an approved mandate from the Executive Board. The Regional Director can offer his/her resignation at any given point in time, within one month notice, allowing for transfer of information and databases, ongoing matters and/or material. The Regional Directors have a voice equal to the Advisory Board: their experiences and suggestions will be given serious consideration by the Executive Board. Yet the Executive Board is free to deviate from this. As members, Regional Directors will have a say or vote in meetings just like any other member. A member may resign from the Chamber by sending his resignation in writing to the Board. This must, however, be done before the beginning of the membership year, or the member shall be obliged to pay the fee for the present year. If fees are not paid for the present business year, the membership is terminated. A Member may be excluded from the Chamber if (s)he has gone against the objectives of the Chamber or has exposed conduct that renders him/her unfit for Chamber membership and when not living up to the Code of Conduct. Such exclusion may be effectuated upon a majority decision of the Executive Board. An amendment to the statutes of the Chamber may be decided upon by a two-thirds majority vote of the members present at an Extraordinary General Meeting called for the purpose to change the amendment, or at the Annual General Meeting, provided the members have been notified at least 14 days before ahead of the proposed amendment and that it has been made available to the members. The General Meeting can decide upon the dissolution of the Association if the number of active Members is less than 20. In other cases dissolution of the Association requires decisions at two successive General Meetings. At both meetings the decision must have been supported by at least two thirds of the voters. In the event of a dissolution the Executive Board decides how the assets of the Chamber shall be distributed, which shall be in accordance with the purpose of the Chamber. Statutes adopted on 16 June 2011 at the Annual General Meeting of the Dutch Chamber of Commerce in Sweden. § 6 has been adjusted on 4 June 2014 at the Annual General Meeting of the Dutch Chamber of Commerce in Sweden.